I'm looking for a geographic location (not service) to host internet services that will give me the lowest latency on connections from two other locations. How would I best determine the most ideal midpoint? That should get you in the ballpark. Anything off one of these highly interconnected IX points will add latency. You can further refine this model by looking at your "locations." 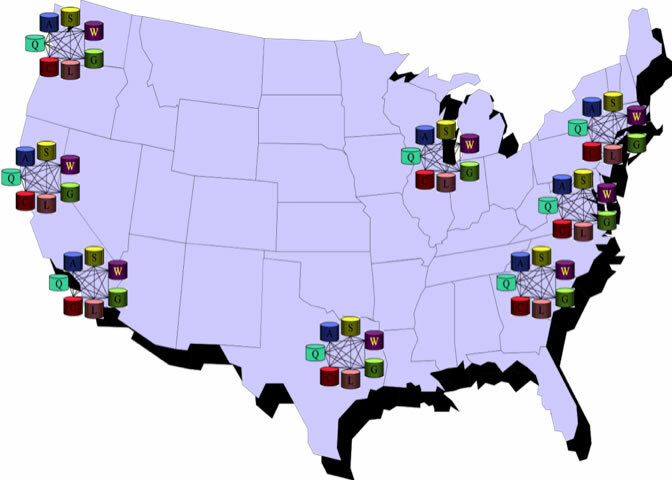 If they are physical locations, see which networks are there. If they are network locations, find out from the providers where they interconnect. Traceroute and mtr can be helpful tools but I would caution against relying on them entirely as routes can change at any moment. Do a few dozen traceroutes between the locations in both directions, determine the fastest/prevalent routes and choose a location with a very small latency to the central point (central in terms of time). Geographical location of a hop can be estimated using whois info. When considering a location, use traceroutes in the same manner to check whether you guess regarding routes is correct. Any further optimizations would require you to know general network topology (backbone at least). Which hosts have low latency across United States and Europe? Accurate way to check latency between Server? How to determine the fastest location for a server? High latency/drops between Cisco switches in two locations. How to troubleshoot?